SCACOM is a shortcut for "Stefans Commodore Amiga Computer Online Museum". It was a German web site (www.scacom.de.vu) from Stefan Egger (now offline). There were German and English magazines called "SCACOM.Aktuell" and "English.SCACOM". Both PDF-magazines can be downloaded for free. Issue 4 was the last issue of English SCACOM. Official reason for the discontinuation was the amount of work it created. English-SCACOM is a free downloadable PDF magazine. It was scheduled every three months. At the beginning it was sheduled every two month. Mein topics included tutorials, experiences with Commodore computer and interviews. Additional content (e.g. background pictures or disks with special versions of games) was also delivered with the magazine. The English issues contains translated articles from the German magazine. 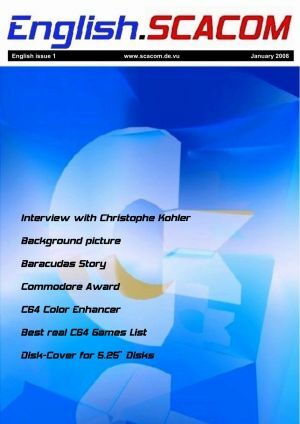 It was a German PDF-magazine for Commodore and Amiga fans. It was scheduled every two months. More Informations about German SCACOM-Aktuell can be found on German C64-Wiki. Some hosters continue to offer downloads of the magazines. Officially, part of the contents (in particular the PDF editions and diskettes) will continue to be offered free of charge on a project page at computer collection vienna. The SCACOM homepage was replaced by the website computer collection vienna. After issue 4 of October 2008 the project was discontinued. The German main magazine was discontinued in August 2011 after 22 issues were made. You need a PDF reader (e.g. Foxit or Adobe Reader). Disk-cover for "Gold Quest 4"
Some articles were uploaded to the C64 Wiki. This page was last modified on 3 August 2018, at 05:01.